Fins are usually the most distinctive features of a fish. They are composed of bony spines or rays protruding from the body with skin covering them and joining them together, either in a webbed fashion, as seen in most bony fish, or similar to a flipper, as seen in sharks. Apart from the tail or caudal fin, fish fins have no direct connection with the spine and are supported only by muscles. Their principal function is to help the fish swim. Fins located in different places on the fish serve different purposes such as moving forward, turning, keeping an upright position or stopping. 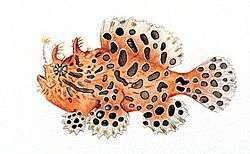 Most fish use fins when swimming, flying fish use pectoral fins for gliding, and frogfish use them for crawling. Fins can also be used for other purposes; male sharks and mosquitofish use a modified fin to deliver sperm, thresher sharks use their caudal fin to stun prey, reef stonefish have spines in their dorsal fins that inject venom, anglerfish use the first spine of their dorsal fin like a fishing rod to lure prey, and triggerfish avoid predators by squeezing into coral crevices and using spines in their fins to lock themselves in place. Adipose fin of a trout The adipose fin is a soft, fleshy fin found on the back behind the dorsal fin and just forward of the caudal fin. 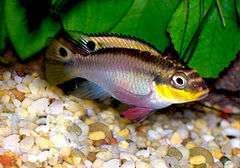 It is absent in many fish families, but is found in Salmonidae, characins and catfishes. Its function has remained a mystery, and is frequently clipped off to mark hatchery-raised fish, though data from 2005 showed that trout with their adipose fin removed have an 8% higher tailbeat frequency. Additional information released in 2011 has suggested that the fin may be vital for the detection of, and response to, stimuli such as touch, sound and changes in pressure. Canadian researchers identified a neural network in the fin, indicating that it likely has a sensory function, but are still not sure exactly what the consequences of removing it are. (A) - Heterocercal means the vertebrae extend into the upper lobe of the tail, making it longer (as in sharks). Drawing by Dr Tony Ayling Some types of fast-swimming fish have a horizontal caudal keel just forward of the tail fin. Much like the keel of a ship, this is a lateral ridge on the caudal peduncle, usually composed of scutes (see below), that provides stability and support to the caudal fin. 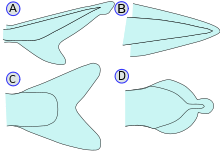 There may be a single paired keel, one on each side, or two pairs above and below. Bony fishes form a taxonomic group called Osteichthyes. They have skeletons made of bone, and can be contrasted with cartilaginous fishes which have skeletons made of cartilage. 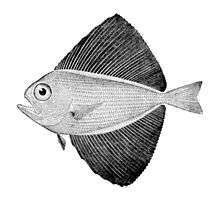 Bony fishes are divided into ray-finned and lobe-finned fish. Most fish are ray-finned, an extremely diverse and abundant group consisting of over 30,000 species. It is the largest class of vertebrates in existence today. In the distant past, lobe-finned fish were abundant. Nowadays they are mainly extinct, with only eight living species. Bony fish have fin spines and rays called lepidotrichia. They typically have swim bladders, which allows the fish to create a neutral balance between sinking and floating without having to use its fins. However, these are absent in many species, and have developed into primitive lungs in the lungfishes. Bony fishes also have an operculum, which helps them breathe without having to use fins to swim. The coelacanth is another lobe-finned fish which is still extant. It is thought to have evolved into roughly its current form about 408 million years ago, during the early Devonian. Locomotion of the coelacanths is unique to their kind. To move around, coelacanths most commonly take advantage of up or downwellings of the current and drift. 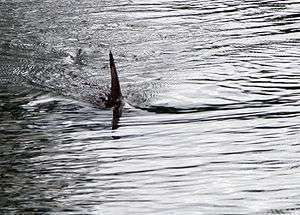 They use their paired fins to stabilize their movement through the water. While on the ocean floor their paired fins are not used for any kind of movement. Coelacanths can create thrust for quick starts by using their caudal fins. Due to the high number of fins they possess, coelacanths have high maneuverability and can orient their bodies in almost any direction in the water. They have been seen doing headstands and swimming belly up. 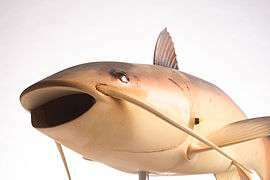 It is thought that their rostral organ helps give the coelacanth electroperception, which aids in their movement around obstacles. 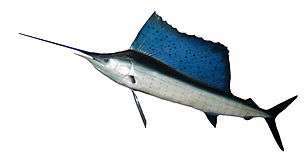 The Indo-Pacific sailfish has a prominent dorsal fin. Like scombroids and other billfish, they streamline themselves by retracting their dorsal fins into a grove in their body when they swim. The huge dorsal fin, or sail, of the sailfish is kept retracted most of the time. Sailfish raise them if they want to herd a school of small fish, and also after periods of high activity, presumably to cool down. Karl Gegenbaur’s concept of the “Archipterygium” was introduced in 1876. 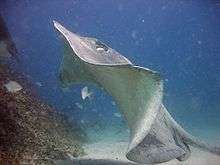 It was described as a gill ray, or “joined cartilaginous stem,” that extended from the gill arch. Additional rays arose from along the arch and from the central gill ray. 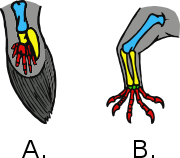 Gegenbaur suggested a model of transformative homology – that all vertebrate paired fins and limbs were transformations of the Archipterygium. Based on this theory, paired appendages such as pectoral and pelvic fins would have differentiated from the branchial arches and migrated posteriorly. However, there has been limited support for this hypothesis in the fossil record both morphologically and phylogenically. In addition, there was little to no evidence of an anterior-posterior migration of pelvic fins. Such shortcomings of the gill-arch theory led to its early demise in favor of the lateral fin-fold theory proposed by St. George Jackson Mivart, Francis Balfour, and James Kingsley Thacher. We find a similar renovation of an old theory in the developmental programming of chondricthyan gill arches and paired appendages. In 2009, researchers at the University of Chicago demonstrated that there are shared molecular patterning mechanisms in the early development of the chondricthyan gill arch and paired fins. Findings such as these have prompted reconsideration of the once-debunked gill-arch theory. ↑ Standen, EM (2009). "Muscle activity and hydrodynamic function of pelvic fins in trout (Oncorhynchus mykiss)" (PDF). The Journal of Experimental Biology. 213: 831–841. doi:10.1242/jeb.033084. ↑ Gene Helfman, Bruce Collette, Douglas Facey, & Brian Bowen. (2009) The Diversity of Fishes: biology, evolution, and ecology. John Wiley & Sons. ↑ Tytell, E. (2005). "The Mysterious Little Fatty Fin". Journal of Experimental Biology. 208 (1): v. doi:10.1242/jeb.01391. ↑ Reimchen, T E; Temple, N F (2004). "Hydrodynamic and phylogenetic aspects of the adipose fin in fishes". Canadian Journal of Zoology. 82 (6): 910–916. doi:10.1139/Z04-069. ↑ Temple, Nicola (18 July 2011). "Removal of trout, salmon fin touches a nerve". Cosmos. ↑ Buckland-Nicks, J. A.; Gillis, M.; Reimchen, T. E. (2011). "Neural network detected in a presumed vestigial trait: ultrastructure of the salmonid adipose fin". Proceedings of the Royal Society B: Biological Sciences. 279 (1728): 553–563. doi:10.1098/rspb.2011.1009. ↑ Stewart, Thomas A.; Smith, W. Leo; Coates, Michael I. (2014). "The origins of adipose fins: an analysis of homoplasy and the serial homology of vertebrate appendages". Proceedings of the Royal Society B: Biological Sciences. 281 (1781): 20133120. doi:10.1098/rspb.2013.3120. ↑ von Zittel KA, Woodward AS and Schlosser M (1932) Text-book of Paleontology Volume 2, Macmillan and Company. Page 13. ↑ Johanson, Zerina; Long, John A.; Talent, John A.; Janvier, Philippe; Warren, James W. (2006). "Oldest Coelacanth, from the Early Devonian of Australia". Biology Letters. 2 (3): 443–46. doi:10.1098/rsbl.2006.0470. PMC 1686207 . PMID 17148426. ↑ Fricke, Hans; Reinicke, Olaf; Hofer, Heribert; Nachtigall, Werner (1987). "Locomotion of the Coelacanth Latimeria Chalumnae in Its Natural Environment". Nature. 329 (6137): 331–33. Bibcode:1987Natur.329..331F. doi:10.1038/329331a0. ↑ Durán, I.; Marí-Beffa, M.; Santamaría, J. A.; Becerra, J.; Santos-Ruiz, L. (2011). "Actinotrichia collagens and their role in fin formation". Developmental Biology. 354 (1): 160–172. doi:10.1016/j.ydbio.2011.03.014. PMID 21420398. ↑ Zhang, J.; Wagh, P.; Guay, D.; Sanchez-Pulido, L.; Padhi, B. K.; Korzh, V.; Andrade-Navarro, M. A.; Akimenko, M. A. (2010). "Loss of fish actinotrichia proteins and the fin-to-limb transition". Nature. 466 (7303): 234–237. Bibcode:2010Natur.466..234Z. doi:10.1038/nature09137. PMID 20574421. ↑ Hamlett 1999, p. 528. 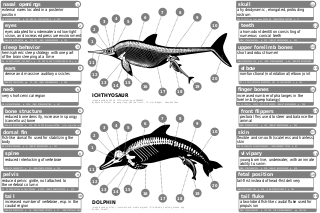 ↑ "A Shark's Skeleton & Organs". Archived from the original on August 5, 2010. Retrieved August 14, 2009. ↑ Michael, Bright. "Jaws: The Natural History of Sharks". Columbia University. Retrieved 2009-08-29. ↑ Nelson, Joseph S. (1994). Fishes of the World. New York: John Wiley and Sons. ISBN 0-471-54713-1. OCLC 28965588. 1 2 3 Sfakiotakis, M; Lane, DM; Davies, JBC (1999). "Review of Fish Swimming Modes for Aquatic Locomotion" (PDF). IEEE Journal of Oceanic Engineering. 24: 237–252. doi:10.1109/48.757275. ↑ Franc, Jean-Pierre and Michel, Jean-Marie (2004) Fundamentals of Cavitation Springer. ISBN 9781402022326. ↑ Nauen, JC; Lauder, GV (2001a). "Locomotion in scombrid fishes: visualization of flow around the caudal peduncle and finlets of the Chub mackerel Scomber japonicus". Journal of Experimental Biology. 204: 2251–63. ↑ Nauen, JC; Lauder, GV (2001b). "Three-dimensional analysis of finlet kinematics in the Chub mackerel (Scomber japonicus)". The Biological Bulletin. 200: 9–19. doi:10.2307/1543081. ↑ Nauen, JC; Lauder, GV (2000). "Locomotion in scombrid fishes: morphology and kinematics of the finlets of the Chub mackerel Scomber japonicus" (PDF). Journal of Experimental Biology. 203: 2247–59. ↑ Flammang, BE; Lauder, GV; Troolin, DR; Strand, TE (2011). "Volumetric imaging of fish locomotion". Biology Letters. 7: 695–698. doi:10.1098/rsbl.2011.0282. ↑ Lingham-Soliar, T. (2005). "Dorsal fin in the white shark,Carcharodon carcharias: A dynamic stabilizer for fast swimming". Journal of Morphology. 263 (1): 1–11. doi:10.1002/jmor.10207. PMID 15536651. ↑ Masterson, J. "Gambusia affinis". Smithsonian Institution. Retrieved 21 October 2011. ↑ Kuntz, Albert (1913). "Notes on the Habits, Morphology of the Reproductive Organs, and Embryology of the Viviparous Fish Gambusia affinis". Bulletin of the United States Bureau of Fisheries. Department of Commerce. 33: 181–190. ↑ Kapoor BG and Khanna B (2004) Ichthyology Handbook pp. 497–498, Springer Science & Business Media. ISBN 9783540428541. ↑ Helfman G, Collette BB, Facey DH and Bowen BW (2009) The Diversity of Fishes: Biology, Evolution, and Ecology p. 35, Wiley-Blackwell. ISBN 978-1-4051-2494-2. ↑ "System glossary". FishBase. Retrieved 2013-02-15. ↑ Heinicke, Matthew P.; Naylor, Gavin J. P.; Hedges, S. Blair (2009). The Timetree of Life: Cartilaginous Fishes (Chondrichthyes). Oxford University Press. p. 320. ISBN 0191560154. 1 2 Aquatic Life of the World pp. 332–333, Marshall Cavendish Corporation, 2000. ISBN 9780761471707. ↑ Bertelsen E and Pietsch TW (1998). Encyclopedia of Fishes. San Diego: Academic Press. pp. 138–139. ISBN 0-12-547665-5. ↑ Purple Flying Gurnard, Dactyloptena orientalis (Cuvier, 1829) Australian Museum. Updated: 15 September 2012. Retrieved: 2 November 2012. ↑ Froese, Rainer and Pauly, Daniel, eds. (2012). "Dactyloptena orientalis" in FishBase. November 2012 version. ↑ Schultz, Ken (2011) Ken Schultz's Field Guide to Saltwater Fish Page 250, John Wiley & Sons. ISBN 9781118039885. ↑ Goodrich, Edwin S. 1906. "Memoirs: Notes on the Development, Structure, and Origin of the Median and Paired Fins of Fish." Journal of Cell Science s2-50 (198): 333–76. 1 2 3 Coates, M. I. (2003). "The Evolution of Paired Fins". Theory in Biosciences. 122 (2-3): 266–87. doi:10.1078/1431-7613-00087. ↑ Gegenbaur, C., F. J. Bell, and E. Ray Lankester. 1878. Elements of Comparative Anatomy. By Carl Gegenbaur ... Tr. by F. Jeffrey Bell ... The Translation Rev. and a Preface Written by E. Ray Lankester ... London,: Macmillan and Co.,. ↑ Brand, Richard A (2008). "Origin and Comparative Anatomy of the Pectoral Limb". Clinical Orthopaedics and Related Research. 466 (3): 531–42. doi:10.1007/s11999-007-0102-6. PMC 2505211 . PMID 18264841. ↑ Begemann, Gerrit (2009). "Evolutionary Developmental Biology". Zebrafish. 6 (3): 303–4. doi:10.1089/zeb.2009.0593. ↑ Cole, Nicholas J.; Currie, Peter D. (2007). "Insights from Sharks: Evolutionary and Developmental Models of Fin Development". Developmental Dynamics. 236 (9): 2421–31. doi:10.1002/dvdy.21268. ↑ Freitas, Renata; Zhang, GuangJun; Cohn, Martin J. (2006). "Evidence That Mechanisms of Fin Development Evolved in the Midline of Early Vertebrates". Nature. 442 (7106): 1033–37. doi:10.1038/nature04984. ↑ Moore, John A (1988). "[www.sicb.org/dl/saawok/449.pdf "Understanding nature—form and function"] Page 485". American Zoologist. 28: 449–584. doi:10.1093/icb/28.2.449. ↑ Thewissen, JGM; Cooper, LN; George, JC; Bajpai, S (2009). "From Land to Water: the Origin of Whales, Dolphins, and Porpoises" (PDF). Evo Edu Outreach. 2: 272–288. doi:10.1007/s12052-009-0135-2. ↑ Gould,Stephen Jay (1993) "Bent Out of Shape" in Eight Little Piggies: Reflections in Natural History. Norton, 179–94. ISBN 9780393311396. ↑ Huge Herr, D. Robert G (Oct 2004). "A Swimming Robot Actuated by Living Muscle Tissue". Journal of NeuroEngineering and Rehabilitation. 1: 6. doi:10.1186/1743-0003-1-6. PMC 544953 . PMID 15679914. Lauder, GV; Nauen, JC; Drucker, EG (2002). "Experimental Hydrodynamics and Evolution: Function of Median Fins in Ray-finned Fishes" (PDF). Integr. Comp. Biol. 42 (5): 1009–1017. doi:10.1093/icb/42.5.1009.